For all of you posting that picture of Keanu Reaves without a mouth to mock the Tesla Model 3's grille-less face, you’re picking the wrong part of the car to mock. The Model 3 has one huge design flaw, and it’s on the other side of the car. Look at that vertical, awkward opening. It’s like what the trunk access was like in the old Rabbit convertibles, or the current Mini and Fiat 500 ragtops. Possibly even the absurd trunk on some of those early Honda Civics or even the Volkswagen Type III Fastback. It’s the compromised trunk opening of a car that’s designed to have a hatchback, but for some random reason, couldn’t. It’s a sad compromise trunk at best. Now, I think I understand why the trunk opens like this, instead of the much more usable hatch on the Model S: Tesla really wanted that unbroken piece of glass to go from the rear and arc gracefully into the roof. And it does arc gracefully, sure. I’m sure it makes things feel open and airy in the back, and help with rear headroom. But it’s the wrong decision to make if it means having this awkward little dryer-style vertical opening to the trunk as opposed to the cavernous chasm of a true hatchback. 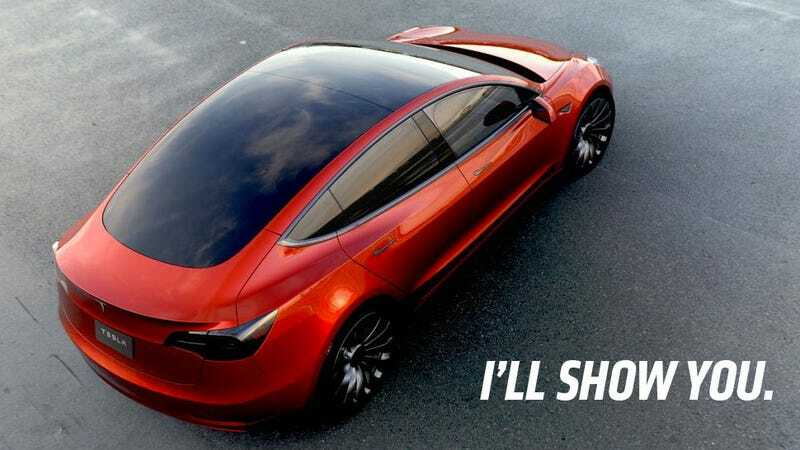 The rear glass-to-the-roof is nice, but I know there will be many Model 3 owners ready to smash that stupid glass as they struggle to get a stroller or bicycle or some other common but bulky item into the back of the car. A hatch would have made the Model 3 incredibly versatile: with no exhaust issues, you could have easily loaded big pieces of furniture or lumber or whatever and let the hatch remain open, like almost everyone with a hatchback has done at one time or another, ignoring the stickers that tell you not to because you’ll be breathing exhaust fumes. With just this stupid little trunk-hole, the whole utility of the car is compromised. Couldn’t the hinge have been high up on the roof, where the glass meets the upper roof panel, and the angle of the hatch just be restricted to a few degrees past horizontal? Was it a cost-savings issue? It’s a shame. The Model 3 already has an ideal five-door hatch shape, and the big-brother Model S shows how a hatch can be done right. What’s the problem here, Tesla? You guys aren’t selling these things for a year; take some time to figure this out.